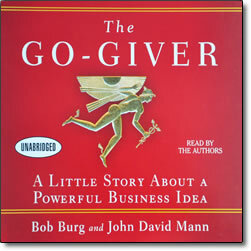 Go-Giver – by Bob Burg and John David Mann – CDs or MP3 – Discount! Over the next week, Pindar introduces Joe to a series of “go-givers”: a restaurateur, a CEO, a financial adviser, a real estate broker, and the “Connector”, who brought them all together. Pindar’s friends share with Joe the Five Laws of Stratospheric Success and teach him how to open himself up to the power of giving. Joe learns that changing his focus from getting to giving-putting others’ interests first and continually adding value to their lives-ultimately leads to unexpected returns.